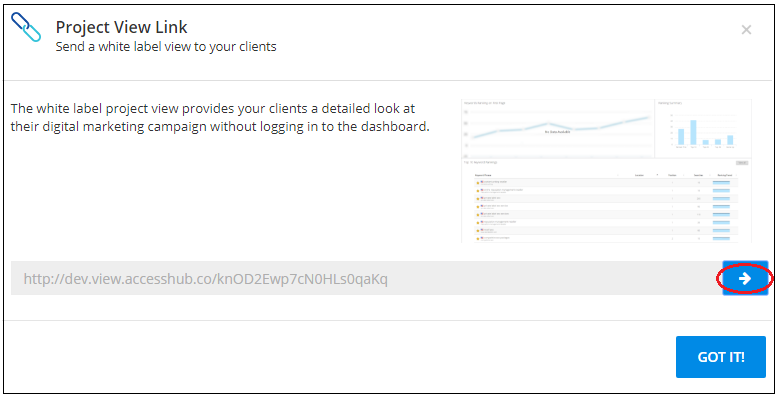 Give your clients a link to view their dashboard and campaign progress. One of the most effective tools your dashboard provides is the ability to give your clients a front row seat to their campaign progress. There are a couple of ways to achieve this with the easiest being to provide them with the Project View Link. 1. From the Overview page of any campaign, click the Project View Link, located on the upper-right side, beneath the menu. 2. Click the button next to the URL to go to the project view. 3. Copy the URL and give it to your client to give them access to the Project View. They will see something similar to the image below but with your agency logo.